Looking for a nice LED TV for your home or office? You are at the right place. In this article, we take a look at the best LED TVs in India. The list is updated as of April 2019 and contains best LED Televisions from top brands like VU, LG, Kodak, Samsung, Sony, Micromax, and few others. The price of televisions on this list is between Rs. 12000 and 50000 so if you are looking for a LED TV under 10000, 15000, 20000, 30000, 40000 or 50000, you will find it here. We have covered LED TVs of all sizes here in this list. You will find TVs having a display size of 32 inches, 39 inches, 40 or 43 inches, 50 inches and 55 inches. If you are going to install your new LED TV in a small room then purchase a small TV of size 32 inch. If your room is of medium size then go for 39 inch, 40 inch or 43 inch. For large rooms and halls, go for 49, 50 or 55 inch LED TVs. The general rule here is that larger the TV, larger should be the viewing distance. You will find both Smart TVs and non-smart TVs on this list. 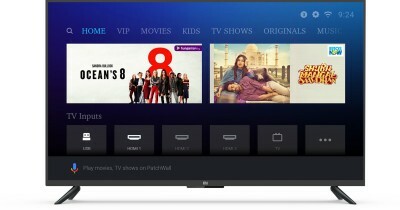 Smart TVs can stream videos and movies directly from the internet. Non-smart TVs will work with cable or DTH only. Smart TVs usually cost Rs. 3000-4000 more than non-smart TVs. You can also turn a non-smart TV into a smart TV by using Google Chromecast or Amazon Fire Stick. Take a look at this article to know more about Chromecast and Firestick. Let's take a look at best LED TVs in India 2019. Blaupunkt is an age-old German company and has been very active in TV manufacturing in India from 2018. Blaupunkt sells top-notch soundbars and other audio devices and is one of the topmost company. The design and build quality are decent. This is a big 55-inch display with 4K resolution and makes the content attractive. It is a smart TV so you can stream YouTube, Netflix, hotstar on your TV without any issue. The remote of this TV can be controlled by voice and you can perform a search, start, stop, volume up and down among other features. There is also an inbuilt Chromecast to cast pictures from your smartphone onto the TV. Blaupunkt being a leader in audio has provided an inbuilt soundbar that provides an enriching experience. The audio output is of 60W and the sound quality is amazing and one of the best for a tv under 40k only. You get 3 HDMI and 2 USB ports on this TV which are enough for any user to connect your set-top box or laptop etc. Overall, the TV is quite amazing given the pricing and you can look to buy it you need a 55 inch big TV. You also get HDR technology that allows you to get the best details out of any content. This is a smart TV so you can connect to WiFi and watch endless content online. You can use the Samsung cloud to sync your phone content. Coming to the speakers, you get a 20 W speaker output which is very loud and clear. For connectivity, you get 2 HDMI and 1 USB ports apart which is only one negative point but most of the users should be ok with it. This TV comes with a 1-year warranty from Samsung and is one of the best Samsung TV under 40000 in India. Overall, this is an excellent 55 inch 4K LED TV under Rs. 40000. Aggressive pricing, great quality, good performance makes it one of the best on our list. This is a large 49 inch Smart LED TV from Samsung. It is the latest TV from the 2018 series. The LED TV comes loaded with the latest features to provide an immersive viewing experience. The display is of great quality with good color reproduction and viewing angles. The images look detailed, thanks to the Full HD 1080p resolution. The TV has the Ultra Clean View feature which uses an advanced algorithm, this feature analyses original content to deliver images with reduced distortion. It helps to improve the experience depending on the content. The PurColor feature provides rick lifelike colors. It is a Smart TV so you can mirror content from your phone or directly stream it via Wifi. You can also download the SmartThings app and get access to features, such as Remote control and Screen Mirroring. The sound output of this LED TV is incredible. The LED TV comes with the Beamforming Technology and 4 Channel 40 W speakers which makes your surrounding seem like you are in a concert hall. You would love to hear music on this LED TV. Overall, the LED TV performs really well. Go for it if you are looking for a 49-50 inch Smart LED TV under 50000. This is one of the most affordable Smart LED TV available in India. It comes from the brands Mi which is also known as Redmi/Xiaomi. Mi products are aggressively priced and offer good quality and performance. This Smart LED TV from Mi is priced under 15000 in India and is fully loaded with features. The TV has a 32-inch display which is bright and sharp with good contrast levels and viewing angles. The upgraded graphics engine helps to reduce noise and improves contrast and brightness. The resolution of the display is HD only. A Full HD display would have made things even better but considering the price point, HD is not a bad option. The sound is delivered by powerful 20 W stereo speakers (10 W x 2) which deliver loud and clear sound. As it is a Smart TV, you can connect it to home or office WIFI and stream videos and movies. The TV is powered by a 64-bit quad-core processor and 1 GB of RAM. In addition to WIFI connectivity, the TV also has plenty of USB and HDMI ports available. Overall, the LED TV performs really well and it is one of the best 32 inch Smart LED TV under 15000 Rs. in India. A nice 55 inch 4K Smart TV under 40000? Yes, it is possible. It wasn't a couple of years ago but it is now. This Cloudwalker LED TV offers great value for money. This is a 55 Inch CloudWalker LED TV with an Ultra HD Resolution Display that delivers sharp images and vibrant colors. The DCTI/DLTI technology further enhances the quality of images and videos. It has support for next-generation HEVC (h.265)(High-Efficiency Video Coding), so this LED TV consumes less space even for high-quality videos. It is a Smart TV with Dual Band WiFi to make the best of your high-speed internet Connection, you can easily download apps like YouTube, Netflix, Hotstar, Amazon Prime etc from Google Play Store. This LED TV has Dual Speakers with Dolby Digital Sound Technology to provide a good sound output. CloudWalker has also launched multiple apps that lets you cast your phone screen over television and to you your mobile phone as a remote. It has a smart search and free content discovery engine for you to easily search the favorite entertainment video online. For external connectivity, it has 3 HDMI and 2 USB ports for connecting to gaming consoles, set-top box, pen drives etc. and gets regular software updates. If your budget is under 40000, and you are looking for a 55 inch 4K Smart TV with Ultra HD display, this Cloudwalker TV is the best option for you. Panasonic makes some really good quality LED TVs. This 49 inches LED TV from Panasonic offers solid build and a bright display. The refresh rate is high which is great for watching sports. The output from speakers is very decent as well. Panasonic has provided plenty of ports on this TV. You get 3 HDMI ports and 2 USB ports using which you can connect pendrive, laptop, set-top box etc. The display on this TV is great and offer clear pictures with good color reproduction and viewing angles. Speakers deliver a sound output of 35W with good clarity and bass. It is a Smart TV so you can play videos and movies via the internet. Plus you can also mirror content from your smartphone. Overall, it is a great TV from Panasonic and one of the best in this range. Kodak recently entered the LED TV segment and have been making excellent value for money televisions. This LED TV is priced under Rs. 30000 and offers a large 50-inch display which is bright and has good viewing angles. The quality of the display panel is really good and because of its large size and Full HD resolution, it provides an immersive experience while watching movies and sports. The display panel has 178-degree viewing angles which means you can get good clarity even when you are watching from an angle. For connectivity, there are plenty of USB and HDMI ports to connect a wide range of devices. Plus, you also get the option to connect it to your WIFI as it is a Smart TV. Mirroring option is also provided if you want to share what you are watching on your smartphone. There are 2 20W speakers which offer loud and clear sound. It is a Smart TV so no need of Google Chromecast or Firestick. The only negative is that it hangs sometimes while switching between apps. Overall a good option from Kodak and one of the best 50 inch Smart LED TV under 30000 in India. Sony is a well known electronics brand and they make some high quality products. Sony products also tend to be little overpriced if you compare them with other brands. 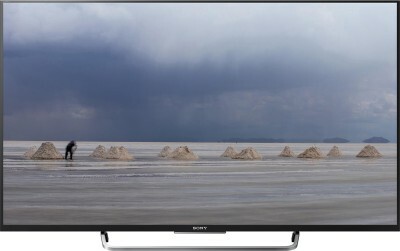 This LED TV from Sony is a great option if it is in your budget. The performance of this LED is awesome. You get good picture quality, loud and clear sound. As this is a Smart TV, you can connect it to your WIFI and play games and watch movies via YouTube or Netflix. Overall it is a great 43 inch Smart LED TV in this price range. The TV comes with X-Reality picture processing feature which ensures exceptional full HD clarity by upscaling the pixels. When the frames are analyzed, each scene is matched with an existing image database to help refine the images further also reduce noise. This results in excellent clarity and improves the user experience. It also has a ClearAudio+ Refines Vocal Clarity feature which makes your listening as lifelike as your viewing. It works by fine-tuning the sound for an enriching experience that seems to surround you. With this, you hear music and dialogue with greater clarity and separation. So this was our list of best LED TVs in India 2019. We hope it was helpful and you were able to find a suitable television for your home or office. Our favorites brands in televisions are VU and LG. If you want to spend less then go for VU LED TVs given above on this list. Mi is also a great option if you need an affordable Smart TV. If you need top-notch quality and can spend more then go for LG LED TVs given in this list above. Ultra HD 4K TVs are in trend these days, take a look at our list of best 4K led tvs as well.